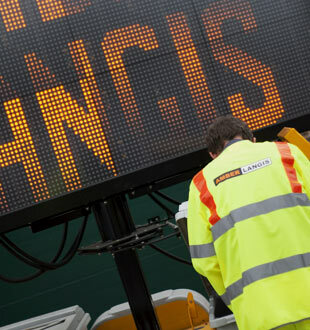 VMS is used widely for traffic control, events and more. The powerful LED display of these amber illuminated signs is visible in all conditions from bright sunlight to dense fog. Powered by solar panels, they are a convenient, energy-saving option. Messages are easy to programme and the units are as reliable as they are effective. Amber Langis Ltd are VMS specialists, so we can help, whatever your requirements. Our amber signs can be fitted with vehicle activated display radar technology – please see our section on VAS for more information. To view detailed technical specifications on our amber LED display VMS, please download our datasheet. Alternatively, if you have any queries, please contact us – we are always happy to help.